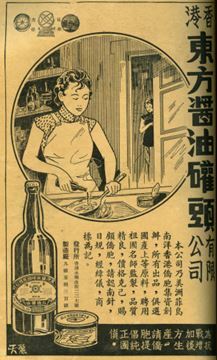 From the 1930s to the 1960s, Oriental Soy & Canning Co Ltd (東方醬油罐頭有限公司) was a leading manufacturer of soy sauce and canned goods in Hong Kong. In fact, it was the largest player in its industry before being surpassed by Amoy Canning in the 1950s. The founder and longtime chairman of Oriental was Chong Sing-chong (莊成宗, 1891-1969), who in addition to being a leading industrialist was also a leader of the local Fukienese community and a prominent “red capitalist” and early supporter of the Chinese Communist regime. A native of Chinkiang in Fukien province, Chong came to HK at the age of 16 to enter the import export business and became the manager of a trading firm focusing on Southeast Asia by the age of 19. Soon he struck out on his own and established two trading firms. By the 1930s, he was an influential business leader, having served in leadership positions at the Fukienese Chamber of Commerce (founded in 1916) and the Hong Kong Sugar Association. In 1938, the Japanese occupied a significant portion of China and invaded Shanghai, Canton and Amoy, which allowed the British controlled Hong Kong to emerge as a manufacturing hub. Chong came up with the idea of establishing a large scale soy and canning factory to support both the inland war effort and also supply to the Southeast Asian market which was historically served by factories in Shanghai, Canton and Amoy. With initial registered capital of HK$200,000, Oriental Soy started in a 50,000 square feet plant in Sam Pak Sin in Tsuen Wan with 70 skilled workers and technicians (and 500-600 part time female workers), many from the mainland, specifically Chuan Chow and Chang Chow in his native Fukien province which were known for their expertise in sauce production. The capital was later increased to HK$1 million and the plant size also tripled to 150,000 square feet in 1941. Given the scale of the project, Chong brought in other investors and the shareholder base of Oriental was unusual at the time in the sense that it was comprised of a diverse group of overseas Chinese – fellow Fukienese from Malaya such as Singapore rubber baron and OCBC co-founder Tan Ean Kiam, Chiuchow tycoons such as Chan Yung-tsai (scion of the Wanglee family) of Kin Tye Loong, the historic Nam Pak Hong trading firm influential in the Thai Chinese trade, Chinese American returnees such as Chan Fu-cheung of the Luk Hoi Tong group and also Filipino Chinese merchants. The firm’s office was located at 227 Wing Lok Street West in Sheung Wan, the heart of the Nam Pak Hong trading community. In its early years, Oriental’s primary markets was Southeast Asia and America, leveraging the trading connections of its shareholders. During the Japanese occupation, production and export business was suspended at Oriental and the business scraped by through selling remaining inventory to the local population and started to build a local following. Since the Oriental plant was on the Japanese invasion route during the Battle of Hong Kong, the plant suffered damage but fortunately most of its equipment was intact so it managed to resume production relatively quickly after the War under the leadership of Chong and deputy manager ST Wu (伍舜德, better known as founder of the Maxim’s group of restaurants later on; working for Oriental as a representative of the Luk Hoi Tong group). In 1947, it received a $300,000, 5 year 5% interest loan from HSBC (華僑日報, 1947-11-28 ). Oriental was a staple in the Products Expo circuit from the 1940s through 1960s and movie stars (although not the top stars) were often present in their booth. 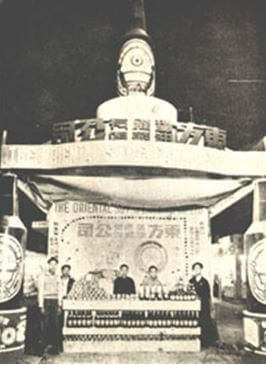 In December 1949, a controversy occurred in the Chinese Products Fair when the pro-Communist Chong insisted that the flag of the new People’s Republic be hoisted at his booth. One of his sons and his staff disagreed with the stance and left – leaving the booth unmanned for 2-3 hours. On October 10 1956, riots erupted in Kowloon as a result of tension between pro-Nationalist and pro-Communist factions and Tsuen Wan was the center of violence. Being labeled as left wing factory, Oriental’s plant in Tsuen Wan was looted and damaged by arson, likely the work of right wing rioters. 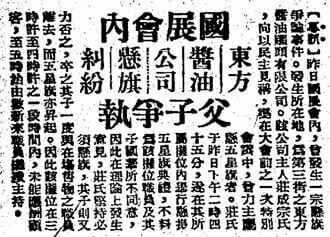 (華僑日報, 1956-10-12). After the situation stabilized, Oriental continued and opened a retail outlet in Kowloon on Tai Po Road. 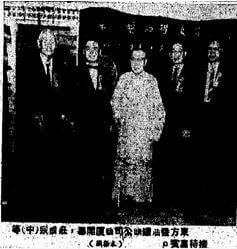 (華僑日報, 1957-10-19) Later it also opened an outlet on Hong Kong Island at 148 Connaught Road. Outside of business, Chong was extremely active in the community. In 1939, Chong and his fellow Fukienese leaders in HK such as Aw Boon-Haw (胡文虎) of Tiger Balm Oil, Aw’s associate Lin Oi-min (林靄民, publisher of Sing Tao Daily) and Filipino Chinese leader Cheng Yushu (鄭玉書) co-founded the Hong Kong Fukienese Association (福建旅港同鄉會) to provide relief to the influx of war refugees from his native province and served as chairman of the group from 1945 to 1964. 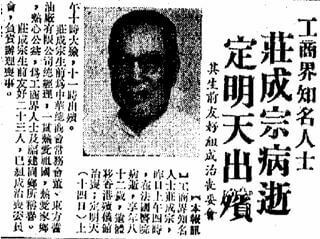 He was on the executive committee of the pro-Beijing Chinese General Chamber of Commerce and was also active in philanthropy, having served as vice chairman of the Chung Sing Benevolent Society in 1933 and a director of the Tung Wah Group of Hospitals in 1946. He remained active into his 70s and in 1965, Chong and other fellow “red capitalists” such as Uy Tiong-Suy of Chuan Chiong Co (distributor of mainland Chinese food and health products), Henry Fok (霍英東) and Ma Man-kei (馬萬祺) established Chinese Products Center (華豐國貨) in North Point to promote China made products. After his death in 1969, Oriental was dissolved in 1974. His grandson Chong Wing-cheong (莊永昌) is a successful investor (at one time 10 percent owner of Miramar Hotels), racehorse owner and poker champion. This article was first posted on 26th May 2017.